Ahhhh, a pretty box on a pretty day. with Dark Chocolate flavored Coating with Crispy Rice. I hate to say it, but I kind of dig the regal purple color on this box. This is exactly what should be on the back of any treat box. Mmmm, I'm pretty excited about our little flat friend here. He lives inside an unlabeled silver foil wrapper. 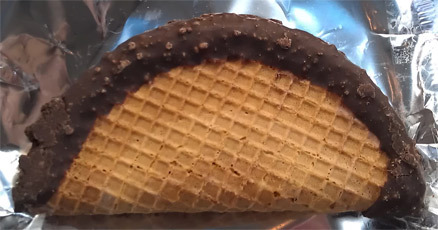 It looks like a standard choco taco, unless you start to think about it and realize the chocolate is definitely darker looking as a normal choco taco is a little brown coating. There you have it: a chocolate filled choco taco. You can just barely see the inner chocolate lining if you look near the bottom. So how does it taste? Kind of like a chocolate choco taco... sorry, couldn't resist. This isn't crazy different, but you definitely notice and I'm digging the dark chocolate on chocolate action here. It's a good combo and I totally expect a peanut butter cup choco taco next year. So how was the shell? Well, for starters, it makes an awesome crunching noise when you dig in. The problem is that it doesn't directly translate to a crisp crunchy taste in your mouth. I guess you would say it still had soft spots of some sort. 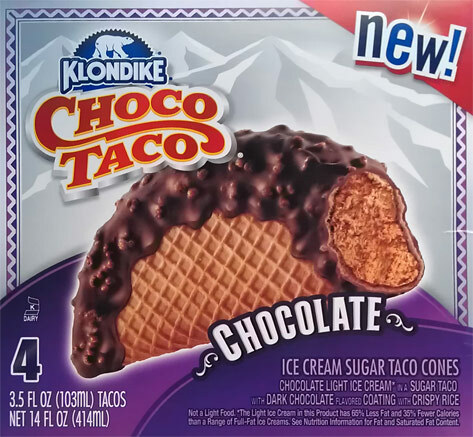 It wasn't horribly disappointing in this respect, but at the same time I get frustrated that every choco taco has a different level of crunch to it. 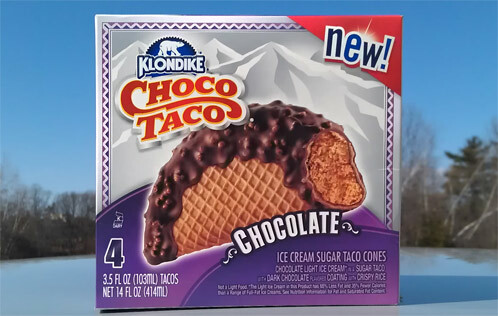 Going back and reading my first choco taco review, I realize that this one made a much better impression. It's gotta be the upgraded dark chocolate coating. I know I ate this one too fast, but it was just going down so easy that. I have no complaints other than a non-perfect shell. Overall, I wanted another when I was done. I love crunch so this was an easy eat for me. It's got the crunch of an ice cream cone but it lasts longer and is easier to eat. Heck, I could totally see buying a box with a bud and then there's two for each of you for a nice after lunch snack... or just have these for lunch (it's got similar calories and total fat as compared to a crunchy taco supreme). On Second Scoop: You know what I just noticed? The taco shell is actually two layers. There's the outer layer that looks like a typical sugar cone, then the thicker inner layer (that may or may not be the soggier part). 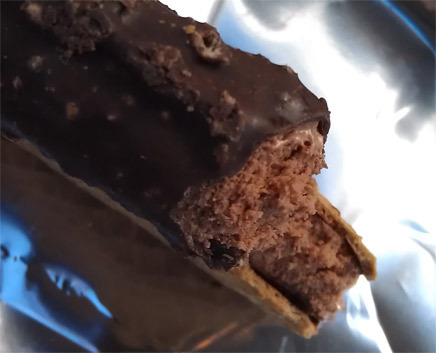 I don't think any of the individual components is outstanding, and they could all use a bit of improvement, but overall, the new chocolate choco taco comes together really nice. I still like it. I seriously need to move to where you are. In my ventures today I was not able to find any of the new products I was searching for. Oh well, I guess good things come to those who wait. Chocolate choco tacos? I am now awaiting the release of the mint, cookie dough, neapolitan, black cherry, rocky road etc tacos. you know it. I would plan on one new flavor a year at least. I'm guessing most people don't shop at 14 different grocery stores like I do hehehe. I wish I had such a selection. The closest places to me are price chopper and hannaford. There's a walmart supercenter about 15 minutes from me and then a shop rite about 30 so my selection is pretty limited. Damn rural upstate new york. I think this looks good; will definitely try! I thought of you today when I was in a Walmart Super Center. Went down the ice cream aisle and saw two new Bryer's and one limited edition Edy's. You've probably already seen them, but they are Double Chocolate Milkshake, Banana Split and Coconut Macaroon. it's luck of the draw unfortunately! Understandable point, though I think most people go in with the understanding that this is meant to be a very crunchy product. I ate a fresh chocotaco straight from the factory. Crunchy like a real taco. By the time it hits store shelves, it's settled and becomes chewey.. gah... ice cream trucks sell the best choco-tacos though, they have to keep restocking. It's super markets with those big freezers that have the bad ones. 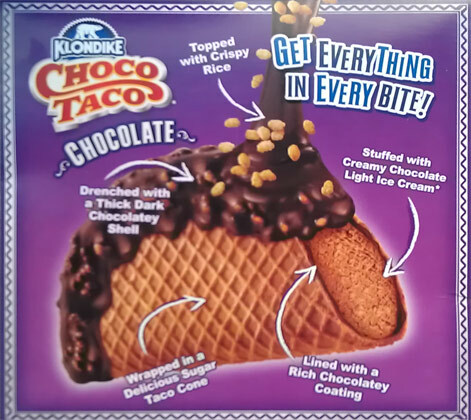 So I have had the original choco taco where the cone shell is crunchy and should be. Why isn't it crunchy now that Klondike bought the rights to that delicious treat that I remember as a young girl? Please bring the crunch back to the cone!!! Waffle cone for any dessert should always be crunchy!